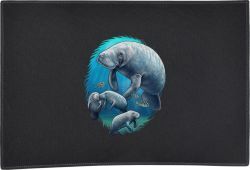 Lightweight door mats heat pressed with Sea Mammals designs. 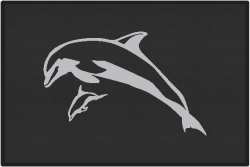 Each 27 x 18 inch door mat features a non-skid latex backing with black fabric piping around the edges of the mat. The welcome mat can be personalized with a name or phrase for an additional charge. 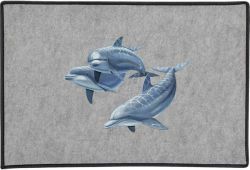 Choose from Dolphin, Manatee, Killer Whale and other Sea Mammal designs. All mats are available in gray and some are also available in black.